Welcome to Mona Lisa Lives Here! The purpose of this blog is to share the goings-on of my middle school art room and sometimes other things. I would like you to feel as if you are a fly on the wall, or for a more artistic reference, a brush in the can or a painting on the rack. I believe the middle school art room is a special place to be and I want to give you a chance to be part of it. Occasionally I will share stories of travel, or my own making, as reflections of my experiences. Enjoy! My name is Alice Gentili and I teach visual art to about about 500 students each year, but I loop with them for their second year, which makes it easier for all of us. 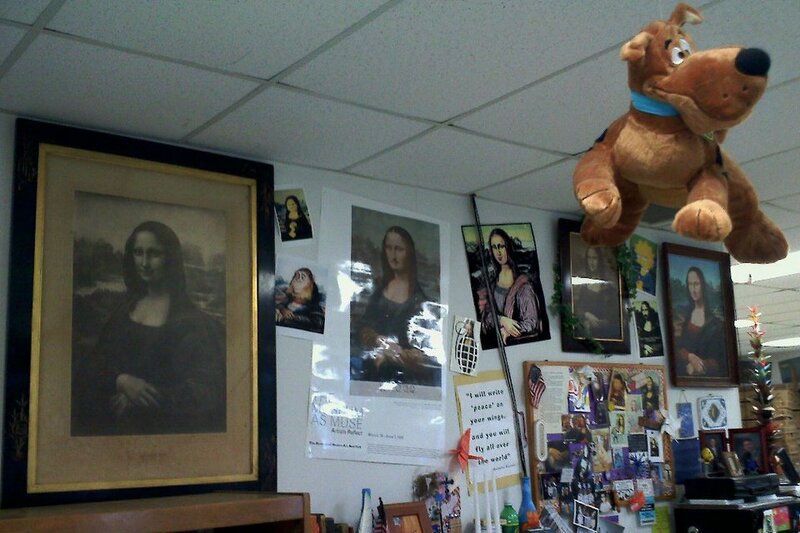 One of our classroom walls holds a collection of Mona Lisas that I have found at flea markets. My students and I go home at the end of every day, but the classroom Monas stay at school. That is why this blog is called “Mona Lisa Lives Here”. Your website is amazing! I teach art at an elementary school in Volusia county , Florida. everything I have seen here, so far, gets me so excited! This is my 32nd year of teaching and I continue to learn so much! Thank you for ALL that you are sharing. You are an amazing person. I would love to meet you someday. Tomorrow, I will share your site with my group of local elementary art teachers on facebook! It was my son James first day of middle school today and when he came home I asked to see his schedule. When I saw his schedule, I noticed he had art for a specialist class. I said to him I’ll see if we can change that to something else as he’s never been much interested in art. He said, No mom, my art teacher is awesome! I want to stay in art. I’m good at art. Not sure what transpired in art class, but I’m sure excited to meet Ms. Gentili! Thank you so much! It was a pleasure to meet James today and I hope he continues to love middle school all 180 days of this school year! Looking forward to meeting you at Open House!